This script will allow the Player and NPCs to move Diagonally on Stairs by just using two Terrain Tags! # This script should be placed between Scene_Debug and Main. # * Place it below the SDK if you use it. # Note: There are two versions of this script, Deluxe and Lite. # first line of the Comment Box with no additional characters like spaces. # be placed above any other script up to either Scene_Debug or the SDK. # itself will be probelmatic at best over stairs. # * Stair Tag Valid? This script is pretty easy to use. Once you have some Graphics you can use for Diagonal Stairs in your Tileset, simply give them a Terrain Tag of 5 for Stairs that go up and to the left, an a Terrain Tag of of 6 for Stairs that go up and to the right. NOTE: In order for Diagonal Movement to occur, you MUST have TWO TILES with Matching Terrain Tags. Comment Configurations: You can configure each event per page to force Stair behaviors, or to have No Stair behavior. Simply add "\use_stairs" or "\no_stairs" to force the type of Stair behavior you want. Characters with "Always On Top" or "Through" will not try to use stairs unless you enable the "\use_stairs" flag. This should not be an isue because you can enable or disable Stair behaviors per character and per Event Page to suit your needs, and change them during gameplay. The Comments of "\use_stairs" and "\no_stairs" (no quotes) only need to be within the Top 10 Lines of each page, and do NOT need to be the very top comment. There will be two versions of this script. A "Lite" version and a "Deluxe" version. The "Deluxe" version is not released at this time. The two versions of the scripts wont be compatible, but that should really be a no brainer. The "Deluxe" version will allow using Events as Stairs, as well as being able to "cover" Stair Tiles. This version requires that all Stairs are done with Map Tiles, so you won't be able to use an Event with a Tile to cause Diagonal Movement in the "Lite" version. The method "check_event_trigger_there" needed to be replaced for proper event triggering and collisions. Other scripts that replace this method may not be compatible. Pixel Movement Scripts are untested. Thank you Enterbrain for NOT including some form of Diagonal Stair Movement as a default part of any RPG Packages as it created a need that I finally filled. Thank you to Blizz for allowing the Demo to be hosted on the Chaos Project server. In the documentation of this script, I mention several times some compatibility with another script called "Modular Passable". That script has not been released at this time. The "Deluxe" version of Diagonal Stairs will allow for using Events as Stairs, which is not available in this version due to the dependancy the Deluxe version will have on "Modular Passable". Edit: Modular Passable and Diagonal Stairs Deluxe has been released. Nice script, I've used this feature in VX and Ace before, surprised there wasn't one for XP yet. However, is there a difference to using evented stairs? Or does this version allow events to pass the stairs? All Events can move on Stair Tiles as long as the tiles themselves have their Passages set correctly. The demo is also useful for an example of how to configure the Passages on Stair Tiles. Evented Stair would basically mean that an Event would use a Terrain Tag, and although that is in the "Deluxe" version, the "Lite" version wont work if you use an Event with a Stair Tile Graphic. 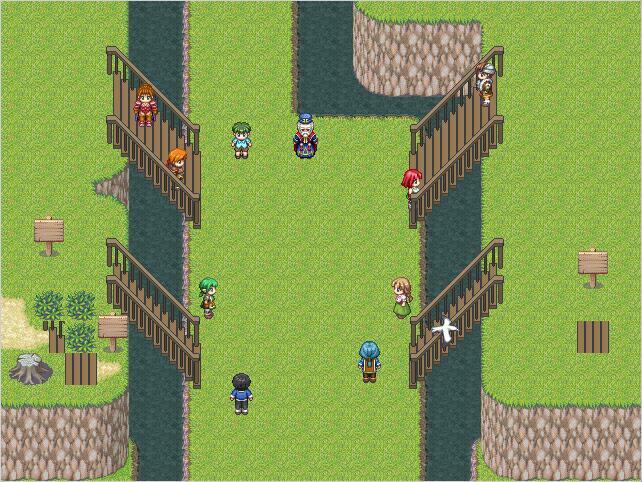 But NPCs and Character Events can move around on ordinary Tile Stairs just fine, as displayed in the demo. I have a much more advanced version (Deluxe) that Im holding off on releasing for a bit as there are a couple of bugs with related scripts that need to be ironed out first. Hopefully as soon as the major bugs are taken care of, I can release the Deluxe version.